When all is said and done, 2016 may be remembered for delivering some of the biggest star-powered bombs in recent Hollywood history. And you can definitely add this past weekend's holiday-themed romantic comedy Mother's Day to the list. The movie only made $8.3 million at the domestic box office, coming in 4th behind The Jungle Book, Keanu, and The Huntsman: Winter's War. We don't have an exact budget, but the movie's opening weekend take barely covers star Julia Roberts paycheck for showing up. And she only worked on the movie for 4 days! There's no question that Julia Roberts is one of the biggest box office draws of the past few decades. But having stayed absent from the big screen over the past couple of years may have taken its toll. Roberts earned a reported $3 million for Mother's Day, according to Variety. She only appears in a supporting role that required just four days of work. That puts her rate at an astounding $750,000 per day. This easy payday confirms that she is still one of the highest paid actresses in Hollywood, even if the box office receipts hint that she didn't really earn it this time out. Even though the number is high, it's nowhere near the record breaking wages she earned back in 2000 for the acclaimed drama Erin Brockovich. She brought in $20 million for that Oscar nominated biopic, which was the highest paycheck for a woman at that time. The legal drama came at the height of Roberts long and illustrious career, and earned $250 million worldwide during its run in theaters. Related: Can Disney's Jungle Book Win Week 3 at the Box Office? The fact that Mother's Day floundered at the box office has some speculating that Julia Roberts days as a top draw leading lady could be over. It also doesn't help that the movie opened a week before Mother's Day. There's always the possibility of bigger second weekend numbers as Moms and their offspring enjoy a nice Sunday out at the movies. But with Captain America: Civil War also opening this Mother's Day Weekend, Roberts' holiday comedy isn't expected to get that much of a lift. Julia Roberts' last two big movies, The Secrets in Their Eyes and Mirror Mirror also proved to be box office failures. But she's not alone. Other big name celebrity peers such as George Clooney, Brad Pitt and Harrison Ford have had trouble opening recent movies that were not part of a franchise or a sequel to a blockbuster hit. George Clooney and Julia Roberts will next share the screen in Money Monster, which opens May 13. Mother's Day ticket sales were definitely not helped along by the amount of terrible reviews the movie got leading into its premiere date in theaters. The movie currently holds a dismal 8% rotten on Rotten Tomatoes. The comedy is the third in director Garry Marshall's Greeting Card franchise, which include 2010's Valentine's Day and 2011's New Year's Eve. Mother's Day is made up of a series of vignettes that all tie up in the grand finale. Joining Roberts on screen are Jennifer Aniston and Kate Hudson. 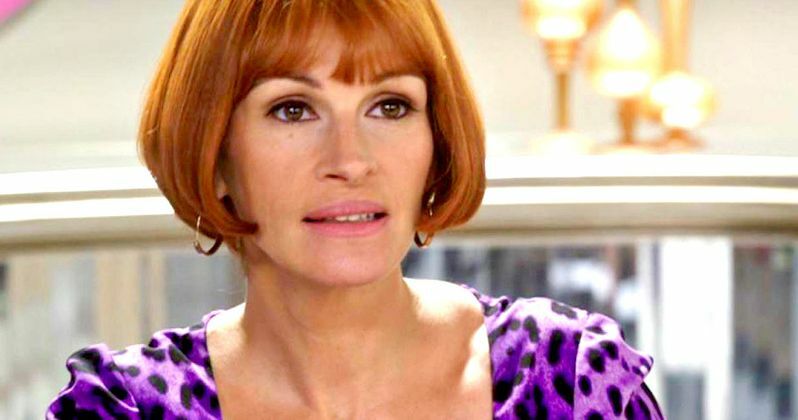 Julia Roberts plays Miranda, a famous home shopping personality. Julia Roberts previously starred in Garry Marshall's Valentine's Day, which was actually a surprise hit. She was paid the same $3 million for that movie, but only clocked in 6 minutes of screen time. That romantic comedy went onto earn $110 million at the domestic box office, something Mother's Day won't even come close to achieving. Roberts didn't turn up in New Year's Eve, and it only made half of the previous installment with $55 million. While there are still plenty of holidays left for Marshall to explore in his greeting card franchise, the awful turnout for Mother's Day could mark it as the last installment.